1. 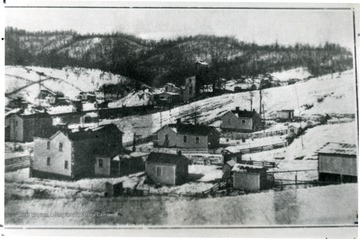 Winter Scene at Lochgelly, W. Va.
Winter Scene at Lochgelly, W. Va.
Mining town of Lochgelly in the Winter. 2. Pursglove, Scotts Run, W. Va.
Pursglove, Scotts Run, W. Va.
3. 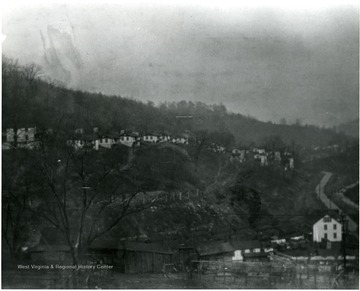 Pursglove, Scotts Run, W. Va.
View of miners homes along a hillside at Scott's Run. 4. 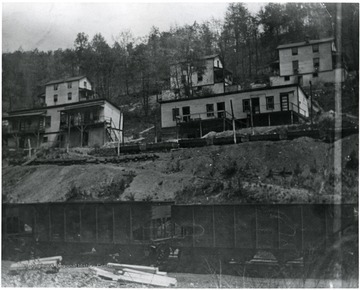 Pursglove Coal Mine, Scott's Run, W. Va.
Pursglove Coal Mine, Scott's Run, W. Va.
5. 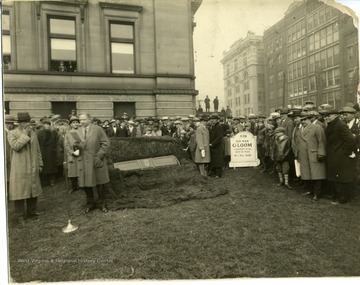 Old Man Gloom Funeral, Fairmont, W. Va.
Old Man Gloom Funeral, Fairmont, W. Va.
Townspeople surround a coffin and grave marker for Old Man Gloom and watch as an announcer reads from a paper in front of a WMMN microphone during Old Man Gloom funeral in downtown Fairmont, West Virginia. 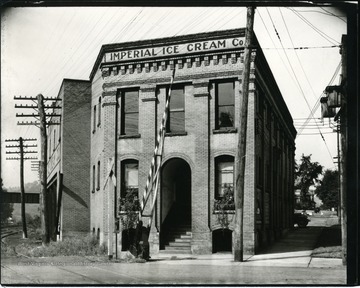 Imperial Ice Cream Co., on the corner of Beech Street and Main Street in Grafton, West Virginia. 7. 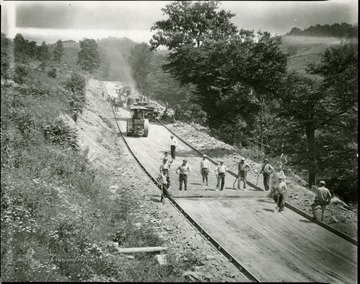 Cole Brothers Construction Crew Working on a Road near Grafton, W. Va.
Cole Brothers Construction Crew Working on a Road near Grafton, W. Va.
8. 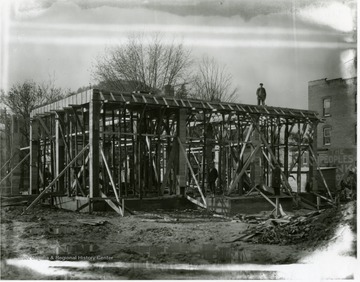 Post Office Under Construction at Philippi, W. Va.
Post Office Under Construction at Philippi, W. Va.
A man stands atop the construction of the Philippi Post Office. 9. 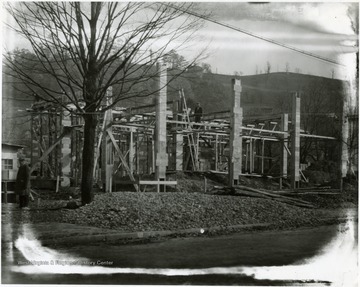 Post Office Under Construction at Philippi, W. Va.
Workers stand on scaffolding around the Philippi Post Office while it is under construction. 10. 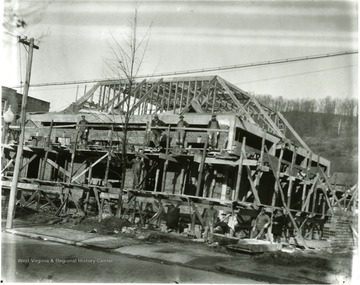 Post Office Under Construction at Philippi, W. Va.
Work being done on the Philippi Post Office. 11. Cole Brothers Construction Crew Building a Road, Grafton, W. Va.
Cole Brothers Construction Crew Building a Road, Grafton, W. Va. 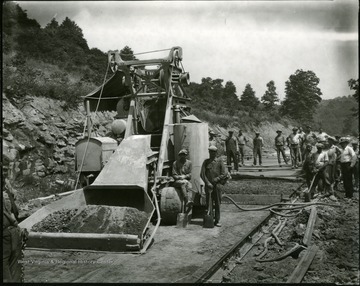 The Cole Bros. crew is laying cement. 12. 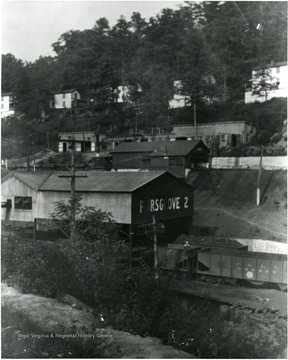 Dodge Brothers Motor Vehicles, Grafton, W. Va. 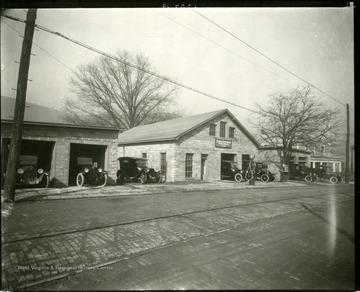 Dodge Brothers Motor Vehicles, Grafton, W. Va.
Several cars are parked in front of the Dodge Brothers Motor Vehicles Garages in Grafton, West Virginia.